Managing a supermarket is a challenge no matter where you are located in the world. With the constant need to change and adapt your business to the latest trends and climates, a massive amount of work in all departments is required, from logistics to marketing, and much more. There are many kinds of developments and solutions, meant to provide a better shopping experience for your customers, which will make your supermarket stand out above all others. Over the past decade we have witnessed a long-lasting transformation in the food industry that comes as a direct result of people changing their eating habits. Awareness of health issues caused by different kinds of food, anti-allergic products and the strong rise of veganism has made the grocery shopping experience totally different. With these changes in mind, there is great demand for new developments and technology to provide customers with the best shopping experience possible. One of these developments has made a big difference in the food industry. IDM is the designer and manufacturer of the most modern and revolutionary dispensing solutions for a wide variety of foods. IDM has a large selection of dispensing mechanisms, adapted for personal or industrial use with various storage and dispensing options. IDM's goal is to provide a clean dispensing experience without spills and mess. IDM provides supermarkets and businesses with the best dispensing solutions for the improvement of their sales and success. The first step towards a better functioning supermarket in all aspects is customer satisfaction and IDM's dispensers provide that satisfaction. IDM's innovative "Free Flow" dispensing mechanism dispenses in bulk portions with a certain level of control. 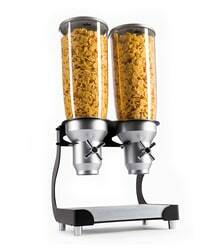 IDM also has the "Pro Serv" with a 'turn and serv' function, the "Multi X, Supremo" and "Pro Portion" dispensers. The "Click Dispenser" can dispense one teaspoon of coffee or sugar with just a single click. 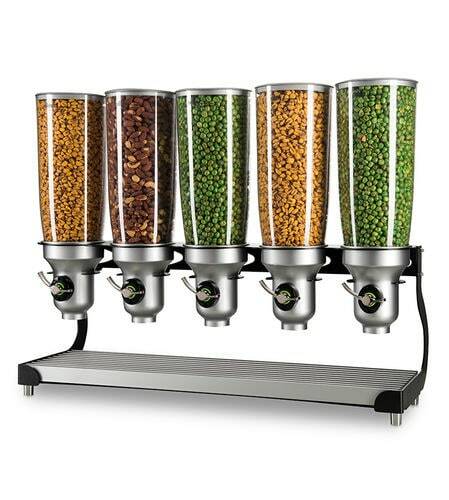 IDM's dispensers store nuts, coffee, tea, powders, cereals and much more. 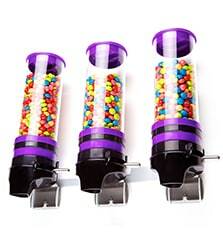 IDM's large range of dispensers have diverse mechanisms and can be adjusted according to your business needs. But they all share the same features when it comes to freshness and cleanliness; IDM's dispensers are completely air-tight, sealing in freshness and concentrating on hygiene. With the rising awareness of freshness and hygiene and the fact that people today enjoy buying food in precise amounts, IDM's dispensers are indispensable for your business. As for supermarket design, space is saved for the convenience of your customers allowing them to move around easily as they shop. You can design the layout of the dispensers on a wall with an attractive and colorful display, making the shopping experience at your supermarket much more exciting. To sum up, a simple minor change in your business can make a massive difference. Customer satisfaction in your supermarket will be improved, leading to more visits and more productivity. 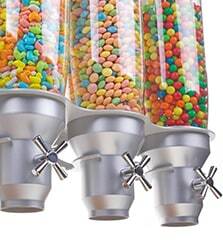 Your supermarket will be really super, thanks to IDM's dispensers. For more information, contact IDM now!